While we were digging around at the Ephemera Fair (see our previous post), we were lucky enough to find a copy of A Book of Typefaces, the wonderful type sample book produced in 1952 by printers W.S.Cowell Ltd; and designed by John Lewis. 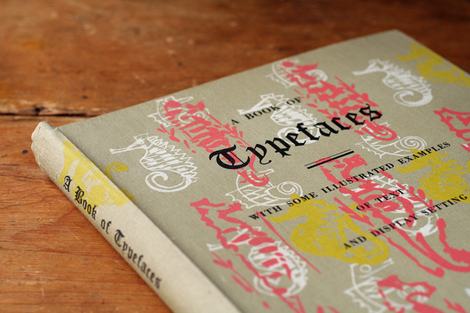 This type book is intended for those who either for their amusement, or in the course of their calling, deal in print. The amateur must be content with the fact that it is limited to the typefaces carried by this printing house. To the professional user that limitation is, of course, a necessity. 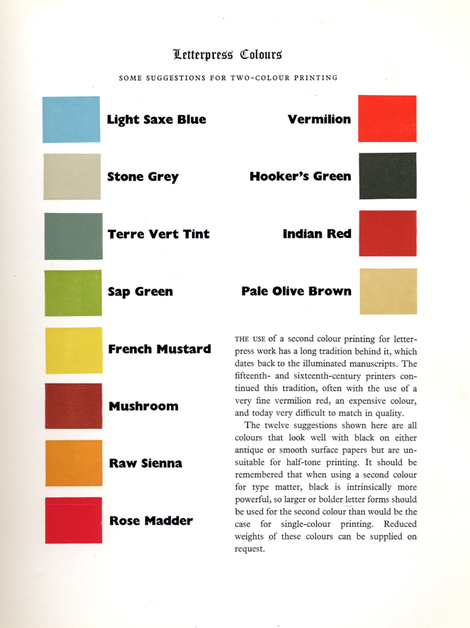 The introduction of coloured illustration, and other decorative matter may distress the typographic purist. Our reason for this is that many succeeding pages of type specimens can become confusing to the layman. 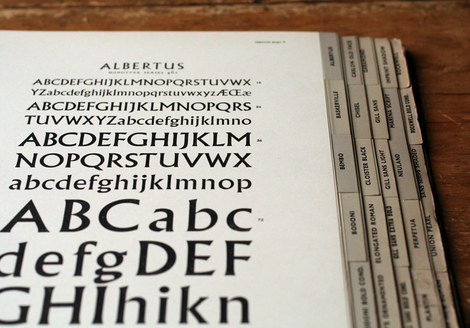 Illustrations offer a relief and an appropriate illustration can often illuminate the qualities of a typeface. 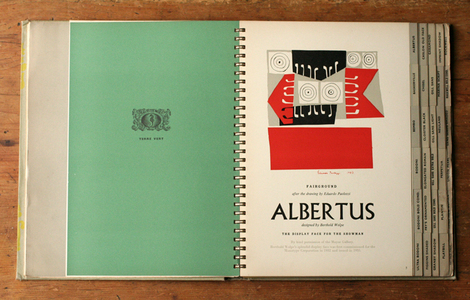 This book has been printed throughout by letterpress on a two-sheet ivorex board made by Tullis Russell & Co. Ltd. It has been Spirax bound by James Burn and Co. Ltd. and cased by Cowells. The cover is printed by offset lithography on white book cloth from some seahorse designs drawn on Plastocowell [they're by Denis Wirth-Miller]. Apart from the specimen pages of typefaces, the text matter for prelims, etc., has been set in Plantin Series 110 and the captions on illustrated pages in Bodoni Series 135. Because it was spiral bound, Cowell's could produce extra pages for the book at a later date, as and when they had new typefaces available. Readers filled in a card when they bought the book, and as the extra pages were produced, they were mailed out to them. The new pages could then just be slotted in to the binding - our copy has 12 of them. John Lewis, the typographer and designer behind the book, was born in 1912, and studied at Goldsmiths, joining the printing works W.S.Cowell after the war, in 1946. He went on to teach at the Royal College of Art, where he founded the private press that ran there from 1953 to 1970. He also published the first real study of printed ephemera with the suitably titled Printed Ephemera in 1962. He died in 1996 - you can read his full obituary from The Independent. His collection of ephemera is now held at Reading University, and includes 20,000 items, dating from the 15th Century to the present day.